Gardoš was a poverty-striken neighborhood inhabited by fisherman and others whose job was related to the river. Today, this is a place for hedonists in search for a new favorite place. They say that the bohemian spirit of Belgrade is moving from Skadarlija to Gardoš. The nightlife in this part of the city is definitely very diverse and special. The Danube is, of course, still an essential part of life in this neighborhood. Some joke that when you sit in any restaurant here, the fish will jump into your plate straight from the river. People come a long way to experience this sort of gastronomic pleasure. First settlement in this area came to life about 7.000 years ago, and the oldest restaurants that still exist date from the end of the 19th century. At that time, a Celtic cavalry graveyard was also discovered on Gardoš. Speaking of numbers, this is the place where you can find the oldest preserved orthodox church in the city – the church of St. Nikolai, built around 1745. The tower which is the most distinct symbol of Gardoš was built more than 120 years ago. In order to celebrate a thousand years in Pannoniam the Hungarians built this tower along with six more monuments on the borders of their country. The tower was named after Hungarian hero John Hunyadi whose army defeated the Turks. He even died on Gardoš, but more than four centuries before the tower was built. 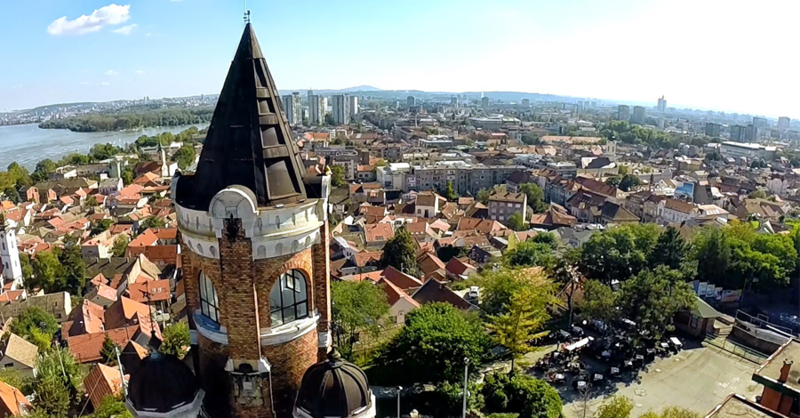 This is one of the highest points and has the best view of Zemun and Belgrade. That’s why it’s the best to visit Gardoš just before the sunset and walk to the top of the tower. The bohemian spirit is so strong that there is always another story you haven’t yet heard, hiding in the narrow streets and old houses.